The eurozone's economy grew by 0.6% in the three months to September, above analysts' expectations, according to EU statistics office Eurostat. For the past 12 months, the growth rate was 2.5%, Eurostat said. Last month, the European Central Bank (ECB) raised its 2017 growth forecast for the 19-nation eurozone to 2.2%, the fastest in 10 years. Eurostat also said eurozone unemployment was 8.9% in September, the lowest rate for nearly nine years. The overall message from these figures reinforces the picture of a eurozone economy that is, at last, gaining some strength. It's a reasonably good growth figure and the gradual decline in unemployment continues. The problem (or one of them) with very low inflation is that it's harder for a central bank to respond effectively if there is an economic downturn. So, much as the ECB will welcome the growth picture, it will continue its efforts (ultra-low interest rates and "quantitative easing") to get prices rising a bit faster for some time to come. The agency estimated that inflation in the eurozone had fallen to 1.4% in October, down from 1.5% in September. That puts it well below the 2% inflation target set by the European Central Bank. Separate figures for the French economy show it grew 0.5% in the three months to September. French statistics agency INSEE said the rise in the eurozone's second-biggest economy was driven by higher household consumption and rising investment. INSEE said consumer spending in the country increased by 0.5% in the third quarter, after a 0.3% rise in the previous quarter. Investment went up by 0.8%, after a 1% increase in the second quarter. France saw growth of 0.6% in the second quarter and 0.5% in the first quarter. It expects 1.8% growth this year. Meanwhile, figures issued by the Greek statistics service Elstat showed that Greece's economy returned to growth in the first three months of 2017. GDP increased by 0.4% in the period compared with the final quarter of 2016, when it contracted by 1.1%. 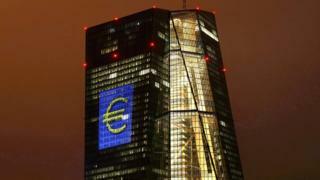 Has eurozone stimulus done its job?